What do you mean how, it's 'cause I'm Billy Mitchell. Nothing seems more lucrative for Namco than to spit out endless re-releases and spin-offs in the Pac-Man series. Does this, a game that could be considered a launch title in some regions, offer an experience that can at all be justified? Why, yes, it does. Because up until the release of Pac-Man Collection, no home console or handheld port of Pac-Man Arrangement had been released. This 1996 arcade game is considered one of the highest points in the Pac-Man series, and now it can be played on the go, included on a cartridge with three other Pac-Man games: Pac-Man, Pac-Attack, and Pac-Mania. Pac-Attack is the odd one out here, a puzzle game where pieces fall from the ceiling and you have to place them in the right way to score points. You have to deal with three kinds of pieces: blocks, ghosts and Pac-Man. Creating a full horizontal line of blocks deletes them from the field and scores you points. Ghosts do nothing on their own, but when Pac-Man is dropped into the scene, the ghosts turn blue and can be eaten. Chain them together for insane point bonuses. Features in Pac-Attack are both the main score-based mode and the challenging set of puzzles that require you to think hard about where certain pieces have to be placed. But the multiplayer is missing, a fact that becomes all too prevalent when playing the other titles. Pac-Man is as Pac-Man was back in the arcades. 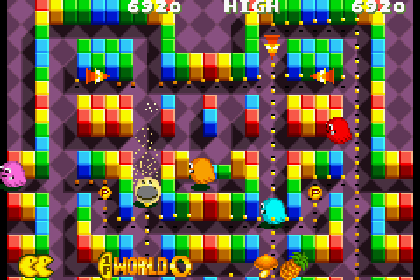 This port of the original game is an as-is release of the arcade game and can be played both zoomed out and zoomed in. The zoomed out mode allows you to see the whole board, but everything is sized down and looks quite frankly rubbish. The scrolling mode is much nicer to look at, but you can only see half of the board at the time, making it harder to plan your route of attack. It does what it sets out to, to offer classic Pac-Man on a portable system. Pac is back, every year. 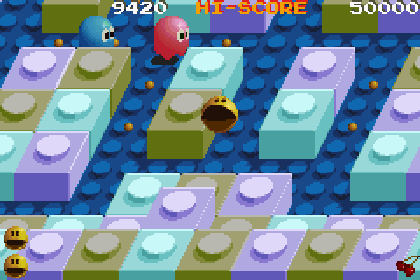 Pac-Mania is an isometric version of Pac-Man where the little baller can jump over his enemies. I don't have much to say about this particular entry in the series because it's far too hideous for me to look at, and you can never see enough of the board to know where you're going. The star entry here is Pac-Man Arrangement, and likely the reason why this game sold as well as it did. This previously arcade exclusive Pac-Man game adds extra gimmicks, weapons, ghost types, and bosses to the Pac-Man formula, turning the bland and predictable experience of Pac-Man into something wildly new and unforgiving. As far as all of these ports go, they're all very authentic and convincingly transferred to the Game Boy Advance. This is especially true about Pac-Man Arrangement, which preserves all of its features except for the multiplayer portion. 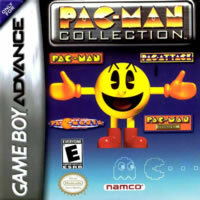 Though at this early conjecture, the Game Boy Advance had little in the way of multiplayer games, so Pac-Man Collection's lack of multiplayer modes is only a small strike against it. After all, the single player content is done right. You'd have to be a Pac-Man aficionado to get anything out of this package, but it certainly delivers on the content side of things.